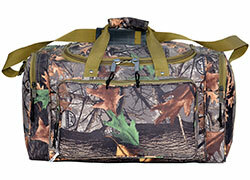 Wildland Camo Bag is built with water resistant 600D polyester material, with an adjustable strap. Comes in 5 sizes. The duffel bag is built with water resistant 600D polyester material, with a D shape main pocket, with 2 side pockets, a long big pocket in front. PE board inside. Adjustable shoulder strap with shoulder pad. All stress points equipped with steel rivets. All piping is covered with tree material. Padded hand pouches. 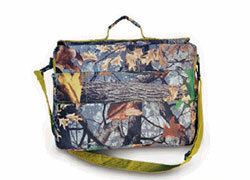 The shoulder bag, has two main compartments which can hold 2 yellow books, and a large front compartment. Also comes with multi pocket organizers for iPhone, etc. Two concealed padded gun pockets at sides. Adjustable, detachable shoulder strap. 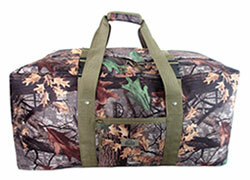 Back side built with a pulling rod fastener for comfort and security travel. 16 x 6 12.